↑ Statement by President of Russia Dmitry Medvedev. The Kremlin (26 August 2008). آرشیولنیب اصلی نۆسخه‌دن on 2 September 2008. ↑ Barabanov, Mikhail (2009). 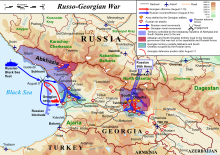 «The August War between Russia and Georgia». Moscow Defence Brief 3 (13). ↑ Volume II 2009, p. 214. ↑ ۹٫۰ ۹٫۱ ۹٫۲ ۹٫۳ Human Rights Watch – Appendix. Human Rights Watch. ↑ ۱۰٫۰ ۱۰٫۱ Tanks 2010, pp. 130–135. ↑ "Russia lost 64 troops in Georgia war, 283 wounded". Reuters. 21 February 2009. ↑ ۱۳٫۰ ۱۳٫۱ Tanks 2010, p. 137. ↑ ۱۴٫۰ ۱۴٫۱ ۱۴٫۲ Tanks 2010, pp. 136–137. ↑ Error on call to Şablon:cite web: Parameters url and title must be specified (ru). "Южная Осетия" (11 April 2009). آرشیولنیب اصلی نۆسخه‌دن on 28 July 2013. ↑ Inal Khashig (14 August 2008). "Abkhaz Open 'Second Front'". Institute for War and Peace Reporting. Archived from the original on 14 August 2008. ↑ ۱۷٫۰ ۱۷٫۱ List of Casualties among the Georgian Military Servicemen. Ministry of Defence of Georgia. آرشیولنیب اصلی نۆسخه‌دن on 7 June 2012. ↑ ۱۸٫۰ ۱۸٫۱ ۱۸٫۲ ۱۸٫۳ ۱۸٫۴ BASIC FACTS: CONSEQUENCES OF RUSSIAN AGGRESSION IN GEORGIA. Ministry of Foreign Affairs of Georgia. آرشیولنیب اصلی نۆسخه‌دن on 2 August 2014. ↑ ۱۹٫۰ ۱۹٫۱ Error on call to Şablon:cite web: Parameters url and title must be specified (ru) (3 July 2009). آرشیولنیب اصلی نۆسخه‌دن on 16 May 2011. ↑ Deceased victims list. Ossetia-war.com. آرشیولنیب اصلی نۆسخه‌دن on 28 May 2009. ↑ Error on call to Şablon:cite web: Parameters url and title must be specified (ru). osetinfo.ru (4 September 2008). آرشیولنیب اصلی نۆسخه‌دن on 5 September 2008. ↑ A Summary of Russian Attack (PDF). Ministry of Foreign Affairs of Georgia. آرشیولنیب اصلی نۆسخه‌دن on 2 August 2014.